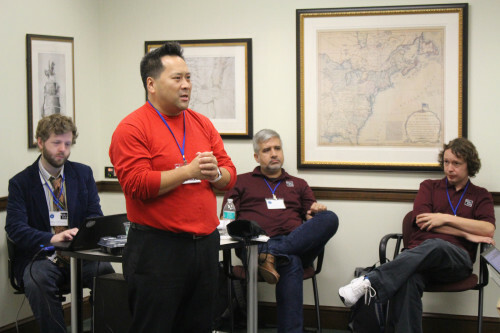 The Wiki Education Foundation was a proud co-sponsor, alongside the National Archives and Record Administration and the National Archives Foundation, of WikiConference USA 2015. 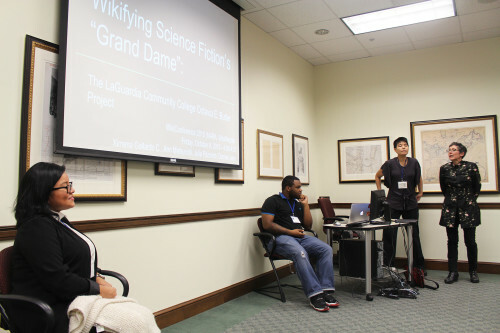 We consider this event a resounding success in achieving its stated goal: Connecting Wikipedians, educators, cultural institution staff, and others to share the work that connects and inspires them. We are grateful to the Wikimedia DC and Wikimedia NYC volunteers whose work made the event possible. While in Washington, D.C., Wiki Ed hosted its first external fundraising event. Wiki Ed board members and staff made meaningful connections and discussed potentials for future collaborations and funding opportunities. We were immediately invited to host another event, a luncheon in New York, for early November. 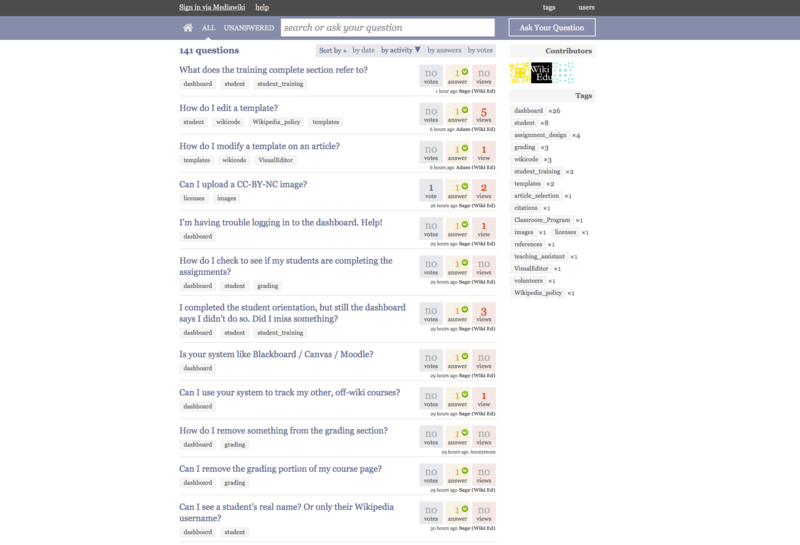 We launched a new question-and-answer tool online, ask.wikiedu.org. The tool allows program participants to pose questions about Wikipedia; Wiki Ed staff or volunteers can respond to these questions. This tool has already been used by instructors, and should have an impact on our ability to scale our staff support by providing a database of the most commonly asked questions and answers. The Classroom Program is now supporting more than 3,000 students in October. This is the largest number of students we have supported to date, and our ability to support quality work from this large of a student group is testament to our great digital tools and staff. The first Featured Article from a Wikipedia Visiting Scholar was approved in October. Gary Greenbaum, at George Mason University, reached Feature Article status for his work on the Boroughitis (http://en.wikipedia.org/wiki/Boroughitis) article. Featured Article designates one of the highest levels of article quality on Wikipedia. 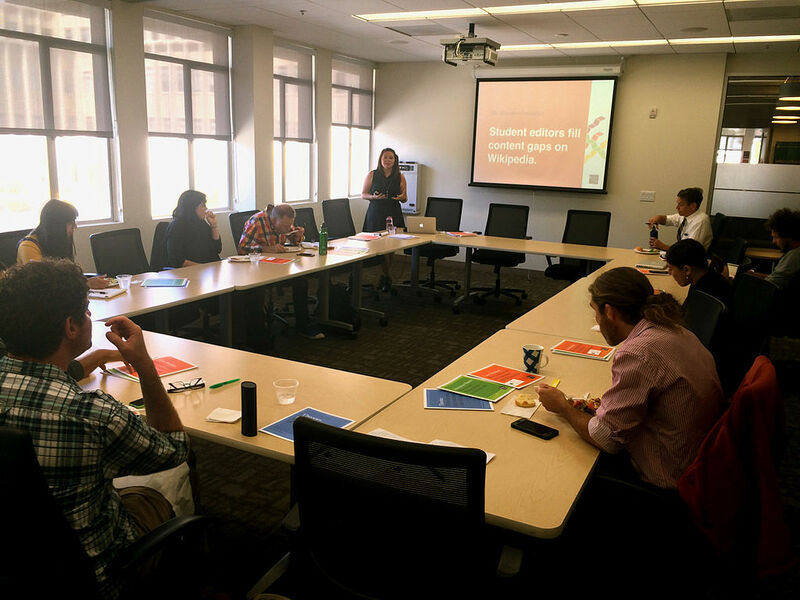 In early October, Outreach Manager Samantha Erickson met University of San Francisco faculty to discuss the Visiting Scholars program. As a result of that meeting, USF plans to sponsor two Visiting Scholars in 2016. After less than a year of formalizing a partnership with the National Women’s Studies Association, Wiki Ed is supporting 25 women’s studies courses during the Fall 2015 term — 16% of all supported courses this term. Targeted outreach and support has proven to be a huge success, and we look forward to expanding our partnerships for similar outcomes. At WikiConference USA, Educational Partnerships Manager Jami Mathewson presented her work with the National Women’s Studies Association as a model example for the benefits of partnerships with academic associations. The Classroom Program team has been busy working with more than 3,000 enrolled students. This marks our largest number of classes and students to date. We’re supporting a considerably larger number of students as compared to spring 2015 (2,290 students). Our course Dashboard and help site, ask.wikiedu.org, have improved the quality of staff support to instructors and enabled us to provide guidance to more students. With most of our students well into the editing part of their assignments, we’re eager to see the impact these tools make in the quality of student contributions. Ximena Gallardo C., Ann Matsuuchi, and former students at the National Archives. 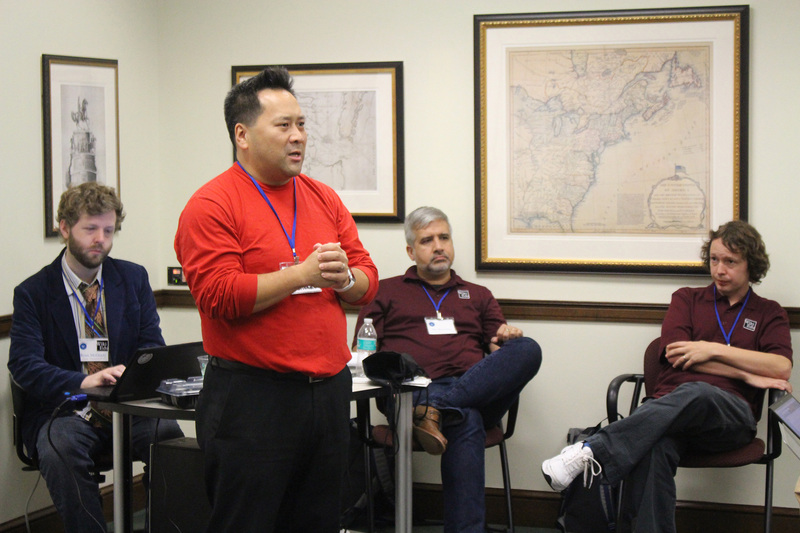 The Wiki Ed team heard firsthand from several instructors at WikiConference USA 2015. 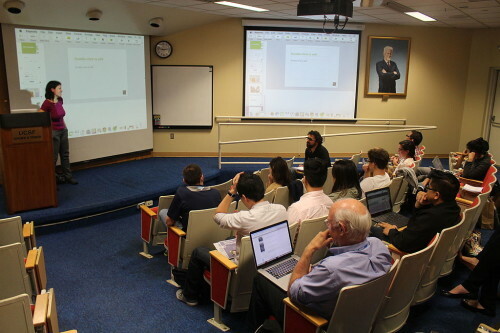 Matthew Vetter (Ohio University), Zach McDowell (University of Massachusetts, Amherst), and Ximena Gallardo C. (CUNY LaGuardia), all longtime participants in the Classroom Program, presented their models for Wikipedia assignments. We also had a chance to speak with Jason Smith and Ann Matsuuchi (CUNY LaGuardia) and meet a few of their students. In another presentation, Wiki Ed board member Chanitra Bishop presented on the variety of Wikipedia assignments she has encountered in her work as a librarian. 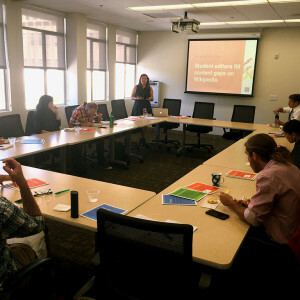 Classroom Program Manager Helaine Blumenthal and Samantha presented to medical students in Amin Azzam’s course at the University of California, San Francisco. What we heard in these encounters is that, despite the extra effort associated with a Wikipedia assignment, students and instructors find it a meaningful and rewarding experience. Helaine Blumenthal presents Wiki Ed to a course at UCSF. We’re already planning our instructor onboarding for spring 2016. We’re looking to the upcoming Year of Science and exploring ways for students to contribute to this exciting initiative. Students in Duke University’s Evolution of Animal Behavior course have been doing exceptional work. Animals engage in distraction displays to divert the attention of a predator; killdeer, a small North American bird, is famous for its “broken wing” displays that it used to lure predators away from their nests. Student editors expand the short (362 word) article by adding sections on the evolutionary origins and adaptive functions of distraction displays. While people usually associate this behavior with birds, students added sections which discussed the behavior in fish and mammals. They added sections looking at the underlying costs (the behavior entails) and sorts of factors which influence the decision of the animal to engage in this display. The student editors expanded the article from 362 to 1339 words (and have continued to expand it since the end of October). Appropriately for Halloween, students expanded the communal roosting article from a 50-word stub with no references into a well-referenced article with more than 2,200 words. They added sections discussing three separate hypotheses which seek to account for the evolution of communal roosting and discussed examples in birds, butterflies, tiger beetles, and bats. They also added three new images to the article. Students created a new article on pursuit predation. While many predators ambush their prey, pursuit predators run down fleeing prey. Video sequences of pursuit predation by cheetahs, lions, and wolves are a staple of nature television programming. Students added sections discussion the strategy of pursuit predation and sections discussing the evolutionary and ecological basis. They also added several examples of pursuit predation, including Matabele ants and dragonflies. Osteophagy is the practice of consuming bones. While the consumption of bones by carnivores is unremarkable, when this process seems strange when herbivores do it, usually as a way to compensate for deficiencies of calcium or phosphate in their diet. Student editors expanded a three-sentence stub into an 862-word article. They added sections discussing the phenomenon in a variety of species including turtles, cattle, and giraffes. They also added a discussion of the practice in humans. Students in the University of Washington’s Interpersonal Media created an article on Hang Ryul Park, a famous South Korean artist and poet who has exhibited his work internationally. Another student improved Russell Street, Hong Kong, an important street, by making better use of available images and adding information about a transportation strike in the 1950s. Students from Diana Strassmann’s Poverty, Justice, and Human Capabilities course at Rice University made several good contributions to articles dealing with issues of global health, education, and gender. Students created a new article on Gender Inequality in Sri Lanka. In addition to its now 40 references, the article makes good use of media from Wikimedia Commons. As part of their research related to poorly covered global health issues, students essentially created the Health in Guatemala article from a redirect, adding images from Commons and information about health care issues and infrastructure. Shirley Barrett: Cinemazing expanded an article on an Australian film director which had languished as a stub for four years. Starting from a single line of biography and a list of films, they included information on her work and important themes therein. Miwa Nishikawa: Working on an article which was a bit larger to start with, Deseolopez fleshed out her biography with information on her films as well as her writing career. Nancy Grant: Cue95 created a new article about this English-Québécois film producer who produced more than 27 short and feature-length films, using existing images on Wikimedia Commons to illustrate their work. The current group of Visiting Scholars started just last month, but they’re already showing us the valuable contributions long-time Wikipedians can make. Gary Greenbaum, the Visiting Scholar at George Mason University, produced three Good Articles: (Lexington-Concord Sesquicentennial half dollar, Huguenot-Walloon half dollar, and Cleveland Centennial half dollar); and one Featured Article (Boroughitis). These designations represent the highest levels of article quality. Meanwhile, Wiki Ed’s most recent Scholar, McMaster University’s Danielle Robichaud, is making significant improvements to the article about the British writer and actor Lady Constance Malleson. Community Engagement Manager Ryan McGrady represented the Community Engagement program at WikiConference USA 2015, leading a session about alternative forms of expert engagement on Wikipedia. He joined Wikipedia Content Expert Ian Ramjohn and Andrew Lih for a session about Wiki Ed’s Year of Science initiative. Throughout October, Ryan has also been working with Samantha and Jami to expand the Visiting Scholars program, conducting outreach and entering conversations with contacts at institutions interested in sponsorships. That team has been developing strategies to bring Scholars on board to work on science-related topics for the Year of Science campaign. Communications Manager Eryk Salvaggio spent the first half of October preparing for, and following up on, WikiConference USA 2015. The event was live-streamed on YouTube, and up-to-date information, quotes, and resources were shared through Wiki Ed’s social media channels. Eryk also recruited several presenters on education-related topics to contribute to wikiedu.org. Thanks to the National Archives, full-day streams of WikiConference USA 2015 presentations at the McGowan Theater are available to view: Friday, Saturday, Sunday. These videos will eventually be edited by WikiConference USA volunteers. However, a list of education-related presentations is available here. 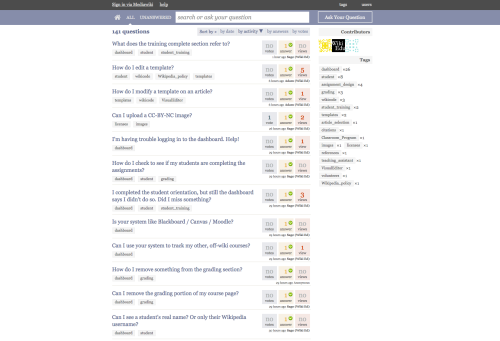 A screenshot of Wiki Ed’s ask.wikiedu.org tool for finding help and posting unanswered questions. The biggest digital infrastructure news from October is the official launch of ask.wikiedu.org, our new question-and-answer site. Product Manager Sage Ross set up our custom instance of the open source Askbotplatform, and the Programs and Program Support teams seeded it with more than 150 of the questions that come up most often from instructors and students. A search bar is now integrated into the Dashboard, and we’ve already seen instructors start to use it on their own to read existing answers and ask new questions. Our main work with our WINTR development partners this month focused on the upcoming in-Dashboard training system. We have a prototype of the new system up and running, including draft content for updated instructor and student training, and we expect to beginning testing it with first-time instructors in November, ahead of a planned roll-out for all Spring 2016 courses. 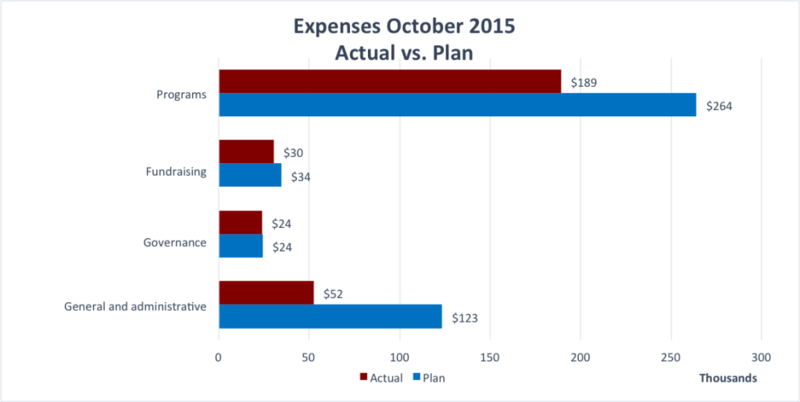 For October, expenses were $295,806 versus the plan of $446,259. The main cause for the $150k variance is two-fold: One of timing ($12k in hiring delays; $11k audit fees; travel expenses $14k; WikiCon expenses $24k) and the other resulting from postponing certain expenses until we have a better grasp on our funding flow. These include $62k for moving/expansion plans; design services for $13k and equipment for new staff $6k. Wiki Education Foundation, Year to Date Expenses to October 2015. 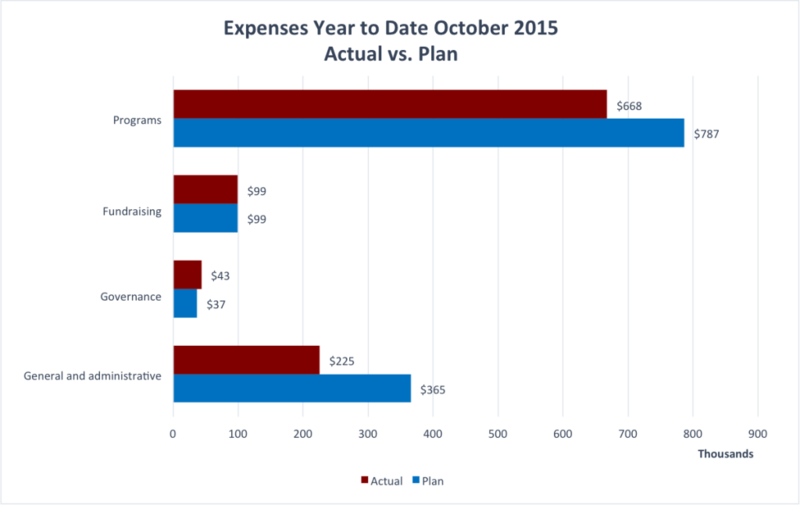 Year-To-Date expenses are $1,035,551 versus the plan of $1,288,252. The $253k variance is the result of $102k of ongoing savings from prior months —”Promotional Items” ($7k), and our “All Staff Meeting” ($4k). Delays and / or temporary postponements of “Personnel” hirings ($14k); “Staff Development” ($13k); “Creative Design” ($9k); “Equipment” associated with hires ($5k); and Staff “Recruiting” efforts ($50k)) in addition to this month’s $150k savings. Our current spending level is averaging at 80% of planned. The Development team held its first external fundraising event. Graciously hosted by Judith Barnett in her Washington, D.C. residence, the event brought together more than 30 people, including select Wiki Ed board and staff, current and prospective supporters, members of academia, and other thought leaders in the open education space. We also welcomed Dipayan Ghosh, Senior Policy Advisor at the Office of Science and Technology Policy (OSTP) of the White House. Wiki Ed Board members and staff made meaningful connections and discussed potentials for future collaborations and funding opportunities. Remarks by Frank shared Wiki Ed’s mission with a new audience and encouraged our guests’ support for the Year of Science. One immediate outcome of our October event was an invitation to host a second event, a luncheon in New York, in the first week of November. In addition to the event and the conference in D.C., the development team has been researching upcoming grant opportunities, and working with development consultant Brenda Laribee on strategies to maximize its efforts. On October 12, the Wiki Education Foundation’s board held its first in-person meeting of the Fiscal Year 2015/16. After Executive Director Frank Schulenburg and Director of Program Support LiAnna Davis reported on the current state of the organization, the board discussed the organization’s future development work, followed by reports from the Mission / Vision, Nominating, and Audit Committees. October 9–11 marked the 2nd annual WikiCon USA in Washington, D.C. Renée coordinated travel and logistics for those attending the conference, including staff, volunteers, and the Wiki Ed board. In cooperation with our partners, the National Archives and the local Wikimedia chapters (DC and NYC), we provided a space where Wikipedians, staff from cultural institutions, and educators could connect with each other, report on past projects, and catalyze new ideas and collaborations. The videos from the conference can be found on YouTube. During October, Frank supported Wiki Ed’s development team through meetings with connectors and potential funders.